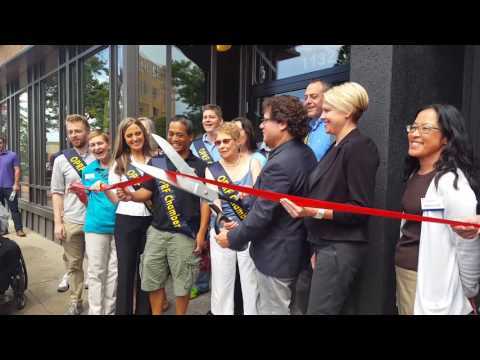 Brad Zerman, owner of Seven Point Medical Cannabis Dispensary, and members of the Oak Park River Forest Chamber of Commerce and Berwyn Development Corporation at the ribbon cutting for the new dispensary in downtown Oak Park. A couple of dozen residents, business leaders and members of the media turned out for the ceremonial ribbon cutting at the high foot-traffic storefront at 1132 Lake St.
Zerman, flanked by members of the Oak Park River Forest Chamber of Commerce and the Berwyn Development Corporation, among others, thanked the village of Oak Park and the business community for its support. During a tour of the facility, Zerman said Seven Point will continue its open house over the weekend for anyone to tour the facility, but after that the dispensary is open to medical marijuana license cardholders. Inside Seven Point, there is a waiting room for non-cardholders. In a second waiting area, a glass-enclosed showroom displays various pipes and other paraphernalia used for consuming the drug. In a third room, patients are allowed to peruse the various cannabis and cannabis-based products. Zerman said Seven Point was lucky to find a location centrally located with access to buses, trains and a huge parking garage adjacent to the Lake Street location. He also noted there's valet parking three doors down from the dispensary, provided by the village as a result of its closure of the parking lot that is the future site of Oak Park Station, a mixed-use apartment building currently under construction. New developments like Oak Park Station will bring hundreds of new residents, and potential customers, to the area over the next few years, Zerman said. He said not every community has welcomed dispensaries to high-traffic business areas like Oak Park. In some cases, municipalities have used zoning ordinances to keep medical cannabis dispensaries away from business districts. In 2014, the Oak Park Plan Commission tried to do just that by recommending the Oak Park Board of Trustees enact a zoning change that would put almost every portion of the village off limits for a dispensary. Trustees rejected that recommendation and Seven Point began negotiations to open a storefront in a strip mall in the southeast corner of Harlem and North avenues. That deal fell through when tenants of the building opposed the dispensary moving in, so Zerman and company began looking at the downtown area. "In this area, everyone's been open arms, so as you can see the chamber of commerce welcomed us to the community with a ribbon cutting, and Berwyn was right there too, so we've developed strong ties in the last two years," Zerman said in an interview. Zerman said cultivators will begin delivering the medical cannabis products next week, and the dispensary is expected to open by Thursday at the latest. He noted that Aug. 25 is the one-year anniversary of the first medical cannabis dispensary opening in Illinois. Zerman said last year that he had expected to open the dispensary in January 2016, but he told Wednesday Journal in July that the holdup was the fault of the building owner and "wasn't in my control." During the Friday tour of the facility, Zerman showed off Seven Point's various products and patient education "how-to" video libraries to residents and members of the media. He said in a news release: "We recognize many people in the state are new users of cannabis and our goal is to teach them everything they need to know from what product to choose for their condition to how to actually administer it. Our staff has undergone extensive training from some of the leading cannabis doctors and researchers in the country and we look forward to helping members of our community experience relief." He noted that the dispensary will carry more than 50 strains of cannabis through a number of methods, including oils, wax, concentrate and edibles, among others. Marc Schlee, 61, a Berwyn resident who attended the grand opening, already is a cardholder and uses cannabis for his stage 4 lymphatic cancer. He said it currently takes him most of the day to travel to Dispensary 33 in the Andersonville neighborhood of Chicago to get the product. Schlee, who is undergoing radiation therapy for the disease, said having a dispensary close by would improve his ability to get the drug, which helps stimulate his appetite. Cannabis is God's gift to mankind.Grateful this dispensary has finally opened, it will help countless people.